The Imperial Amazon or Parrot (Amazona imperialis) is also known as the Dominican Amazon, August Amazon, or Sisserou Parrot. This parrot is recognized as the National Bird of Dominica and is prominently displayed on this island nation's Coat of Arms, the National Flag, The Public Seal, The Mace of the House of Assembly and Dominica’s Honours for Meritorious Service to the Country. 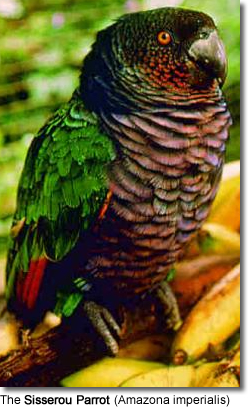 The Imperial Parrot is endemic to the Caribbean island nation of Dominica in the Lesser Antilles where it inhabits mountain forest areas above 2,100 ft (625 m). Only a small population of less than 100 birds of this striking parrot have survived the loss of habitat, trapping for the pet trade and natural disasters, such as hurricanes. They are now listed on Appendix 1 and II of CITES as threatened / endangered species. In the wild, they are mostly observed singly, in pairs or small groups of up to 10 birds. They prefer to sit on the top of tall trees. As they are usually quietly resting or feeding in the high canopy of the forest, they are very difficult to detect, especially so as they are well camouflaged by their plumage. These parrots tend to be shy and cautious. They are agile climbers and strong flyers with powerful wing beats occasionally interspersed with gliding phases. They nest in tree cavities and eat a variety of fruits and seeds. This parrot is seldom seen in populated areas, and is found mainly in rain forests at high elevations. The Imperial Parrot is the largest member in the genus Amazona, averaging up to 17.75 - 18 ins (~45 - 48 cm) in body length - including its tail. They are about 8 inches or 203 mm wide and weigh around 2 pounds (0.9 kg). When the wings are spread out, the distance from tip to tip is 30 inches (762 mm). It has a beautiful green and purple plumage, with a green back, purple neck, green-tipped red tail and purple below. The head is brownish-purple variably washed greenish-blue with black edging to feathers. The ear-coverts (feathers covering the ears) are reddish-brown and the cheeks are purplish-brown with narrow black edging. The curved beak is grey; the irises are orange-red and the feet grey. Immatures look like the adults, but the back of their heads and napes are green. The rear of their cheeks has a green tinge. Their irises are brown. These parrots mate for life and are extremely faithful to each other. A parrot will only seek another mate when its mate dies, and even then, it may simply grieve to death rather than find a new mate. The Imperial Amazon is endangered in its natural habitat due to habitat loss, illegal trapping for the cage-bird trade, and occasional hurricane-related damage. It is most vulnerable when young and it faces the greatest danger while still in chick stage. It is then exposed to further danger from three species of birds (Grive, GriGri and Malfini), snakes and the opossum. Less than 250 mature individuals are still believed to be found in the wild. This species now has an Endangered status on the IUCN Red List of Threatened Species; it is listed on Appendix I of CITES making trade in wild-caught birds illegal; and is also protected by local laws. To my knowledge breeding in captivity has not yet been achieved and they are seldom kept in aviculture. This parrot is initially not as hardy as other species and requires very careful acclimatization. Many of them die after only a few months in captivity. Heated, sheltered areas and a roosting box are recommended, in addition to careful monitoring of the parrot's health status by a qualified avian vet. However, once properly acclimatized, they are pretty hardy. 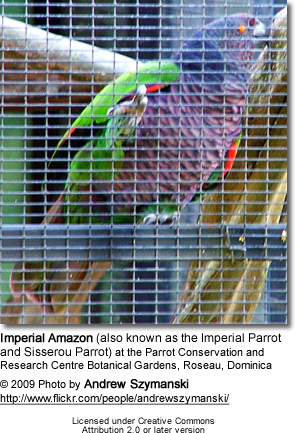 Due to their acute risk of extinction, any Imperial Amazon in captivity should be placed into a breeding program to hopefully prevent this species from joining the long list of extinct parrots. They are usually not as active as other amazon species, are strong chewers and enjoy bathing. Breeding: The breeding season is likely to commence in March and lasts until July. In the wild, they like to nest in tall trees, nesting in hollows of 30-35 ins (75 - 90 cm) in diameter, with an entrance hole of approximately 18 ins (45 cm). The hen lays 1 to 2 eggs. Accommodation: These parrots need spacious accommodations. Outside flights are preferable and their minimum size should be about 32 x 9 x 8 ft (10 x 3 x 2.5 m) with an adjoining sheltered area of 9 x 9 x 8 ft (3 x 3 x 2.5 m). As they are heavy chewers, metal construction is essential. Their nesting box should be around 14 x 14 x 48 ins (35 x 35 x 120 cm). In their natural habitat, the diet of the Imperial Amazons consists of seeds (especially Dacryodes excelsa), palm fruits, nuts, fruits, flowers, buds and berries. In captivity, they should be fed a varied diet of fruits (apples, bananas, oranges, etc.) and vegetables (carrots, tomatoes, cucumbers, etc. ); a good quality seed mix consisting of safflower, oats, wheat, hemp seeds, buckwheat, canary grass seed, millet and some sunflower. Small quantities of pine-nuts regularly should also be provided. Biscuits and greenfood, such as dandelions, also add valuable nutritious components to this parrot's diet. A good quality vitamin and mineral supplement should be included in its daily dietary program. This parrot is inclined to obesity if not ample opportunities for exercise are provided. 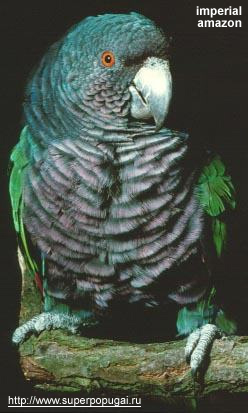 Peanuts have also traditionally been fed to amazon parrots. However, peanuts are often contaminated with aflatoxin, a fungal toxin. Aflatoxin is carcinogenic and causes liver damage in birds, other animals, and even humans. Roasting reduces aflatoxin but does not eliminate it entirely. North American peanut producers are currently working on eliminating contaminated peanuts from their products. Especially peanuts with dark spots on them should be considered suspect, but even those that look clean and perfect could possibly be contaminated.